Absolutely drop-dead gorgeous swathe of thick droning guitar ambiance from Toronto project Northumbria. Utilizing extreme volume and a completely improvisatory approach (everything here having been recorded live), the duo of Jim Field (guitar) and Dorian Williamson (bass) build up dense architectures of electrified onslaught coerced into shades of severe and heartbreaking beauty, arriving at a sound somewhere between the stoic grandeur and melodicism of Sigur Ros and the gigantic tones of classic Earth. This is extremely serious and structured sound, based on an innate sense of communication between two people dialed in to one another almost exactly, creating a complex and intricate web of syrupy, flowing electricity married to the cavernous aesthetics of drone overlords like Troum and Eliane Radigue. It's a near-perfect debut record, an awesome statement of both intent and artistry. Everything here works together; music, design, and artwork all cohere into a distinct and organic vision, giving the impression of several hands becoming one. In that sense I'm reminded of units like Wolves in the Throne Room: the musical and personal bond between the members is so strong it can't help but display itself in the shared artistic output that both references and transcends its influences. That comparison goes a little further with Northumbria. While obviously not a black metal project in any sense, they do share some similarities to more atmospheric BM projects (and not just because of their logo, designed by "lord of the logos" himself, Christophe Szpajdel) in both sound and aestheticism. 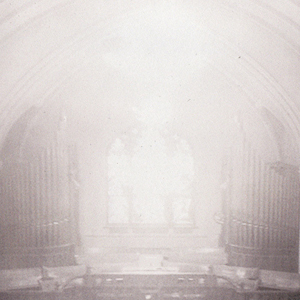 The massive reverberations felt and heard throughout "Northumbria" betray a familiarity with projects like Paysage d'Hiver and Lustre and the lovely visuals that accompany the record display a fondness for churches, candlelight, decay, and the overwhelming majesty of the natural world. Northumbria are one of few bands to actually nail that sense of expansiveness with their music; every track here extends itself out into the world alongside the listener's consciousness and the end result is a feeling of being engulfed, by both the sheer weight of the sonics and the glacial vistas they so effectively conjure. I'm reminded heavily of Werner Herzog's journeys to the Arctic across the album's span, the focus on endless washes of beautiful nothingness suggesting the utter immensity of the universe and mankind's diminutive place within it, an ever-growing blur of both vision and sound. This is the sort of recording that makes you feel smaller than yourself, each piece pulling you further into yourself, wanting you to arrive at a subconscious terminus where the body and the corporeal surrender to the purer manifestations of a cosmic intellect. There is a truth that we're slowly growing deaf to. Individualization becomes a barrier to a greater sense of community and collectiveness, a oneness that we should share with the world. Identity is derived from psychological malady, itself a rotten tendril branching off of modernity and cultural collapse. We've lost touch with the true actual. The aching beauty found in the work of groups like Northumbria serves as a reminder of what is truly worthwhile. That belief in the power of nature and commonality firmly allies the group with more culturally regressive black metal projects; Northumbria's mastery of the language imbues their music with an emotional heft comparable to that of Mogwai or Sigur Ros at their most heart-crushing. I feel like I'm weighing everything down with superlatives. I find myself struggling because for me this is the sort of record that goes beyond any sort of easy intellectual appreciation. There's something here that defies categorization or explanation. It's past words; much like experiencing Sigur Ros, it simply has to be felt and taken in to be understood. This is music meant to be experienced physically, hence the enormous volume (even the band themselves urge listeners to play the album as loud as possible); "Northumbria" was recorded in a church and mastered by James Plotkin, so you really get a sense of the intent. The volume becomes something greater than the music, a vehicle for transcendence and transformation; so too the instrumentation. Guitars and bass, as recognizable as they are to us in the now, become something altogether more unique and towering. They become raw experience, torn from a specific moment and wrought into the language of immediate emotion. Each held note exists as a testament to some sort of inner yearning, a desire unfulfilled or a dream gone unrealized. When those notes erupt into feedback it's a glorious acceptance of the unknowability of your experience; anything could happen in any number of ways. Like Mogwai, Northumbria turn sadness and sorrow into a magnificent sense of triumph, an eruption of frustration and angst that slowly transforms itself into exuberance and resilience. The drones here are far from flat, instead gorging themselves with poignancy and beckoning you ever further in. It's hard to believe this stuff is improvised, but I believe it really is. There's a joy and spontaneity here that eclipses any notion of composition or technique. To borrow from the black metal world again, it's difficult for me to see anything being much more "true" than this. Like improvisational contemporaries Skullflower, the goal is moving beyond the physical. Whether the chosen path is dark or light is irrelevant; it simply has to be illuminated. Northumbria dazzle the listener in a flux of white beaming light and beckon you to follow them to the other side of it. "Northumbria" is a very special record. There is something here larger than the good majority of what's available. Everything about this release commands focused attention. The design and packaging are exquisite; photographs and inserts accompany a lovely matte envelope and a monochromatic color scheme that reinforce the stoic and wintry feeling of the music as a whole. There's an emotional resonance here that I can't deny, and can only compare to other artists whose work has moved me in such a deep and profound manner. Like Birchville Cat Motel or Sigur Ros (again, I know, but they're really the best example of what I'm striving for) or Lyrinx or Troum, there's is something magical here. This is music free of contrivance and totally immersed in a larger concern, an astral concern. These are the sounds you hear in the clouds, in the oceans, in the deepest forests, at the tops of mountains, inside the stars. This music wants you existing inside of it, free of the lurid banality of the modern world. You are welcome here. It's indescribable, and I cannot recommend it more highly. One of my favorites of 2012, easily. Stunning.